General Topics & Doctrine | Intellectuals Don't Need God and Other Modern Myths | Watchman Fellowship, Inc. 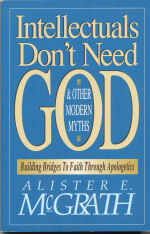 Intellectuals Don't Need God is for people who are not convinced by the arguments of classical, rationalistic apologetics, for people who feel that Christianity must have a broader appeal that to reason alone if it is to be persuasive to non-Christians. Alister McGrath shows convincingly that reason is only one of many possible points of contact between the non-Christian and the gospel. In today's world, nonrational concerns -- such as a sense that life lacks focus, an unconscious fear of death, a deep sense of longing for something unknown we don.t have but know we need -- are much more effective points of contact for apologetics. In this book, Dr. McGrath (who is both a theologian and a scientist with a Ph.D. in microbiology) combines the clarity of a brilliant scientific mind with a deep commitment to Christ and to reaching non-Christians. Intellectuals Don't Need God is for anyone who has questions about the validity of Christianity as well as for students, pastors, and lay leaders. Anyone who works with students and young people especially needs to read this book. As McGrath says, "apologetics is not about winning arguments -- it is about bringing people to Christ."